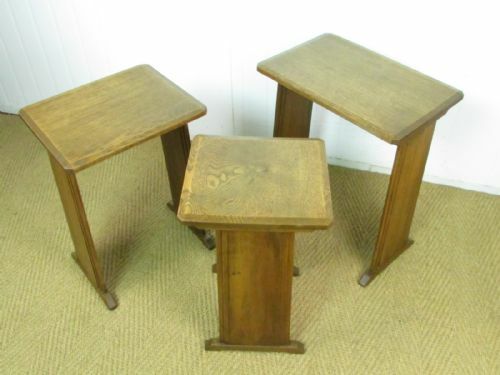 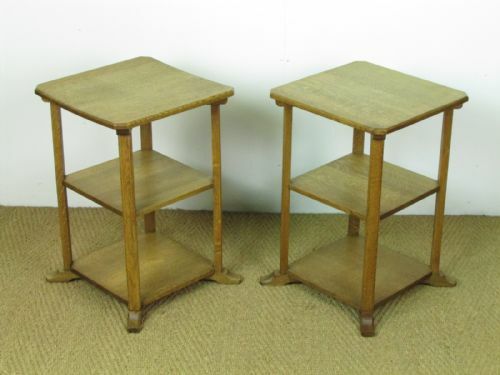 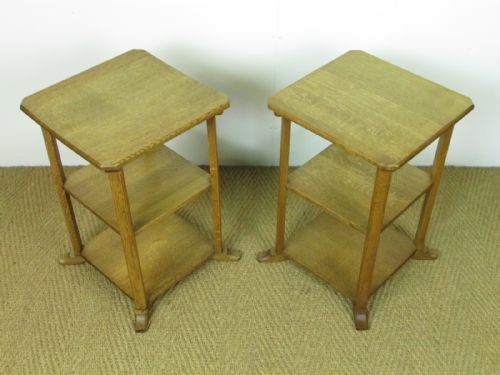 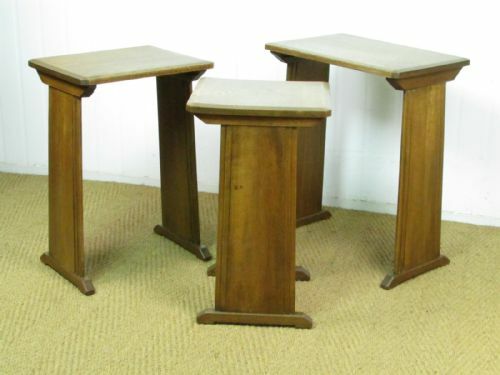 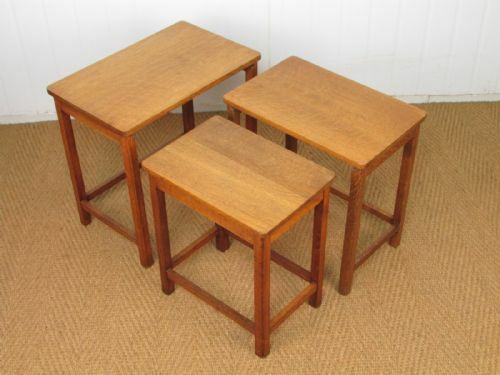 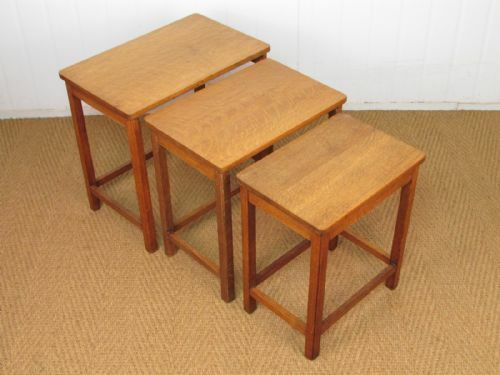 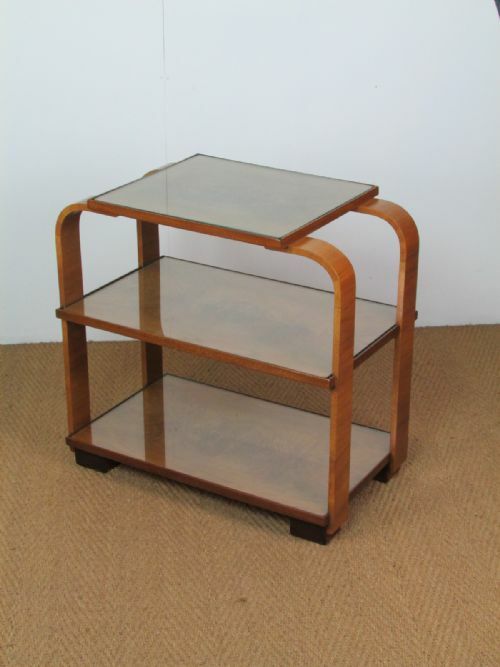 The tables: An Iconic and stylish set of 3 nesting tables designed by Paul Matt for Brynmawr Furniture c.1930. 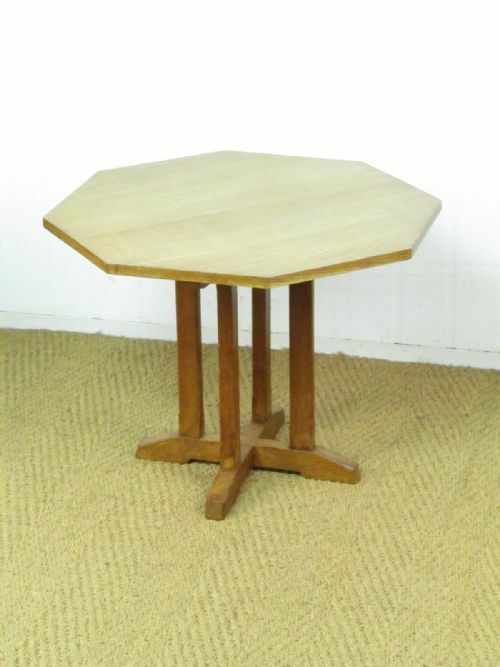 Each table is constructed in solid oak and has a subtle A-frame stance. 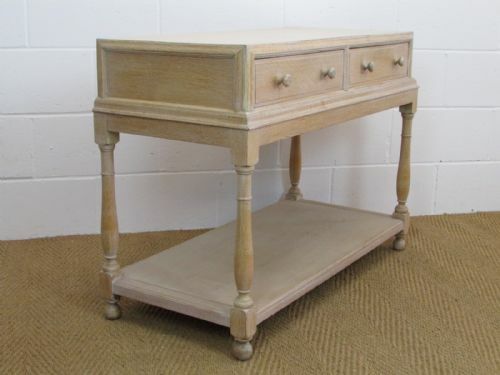 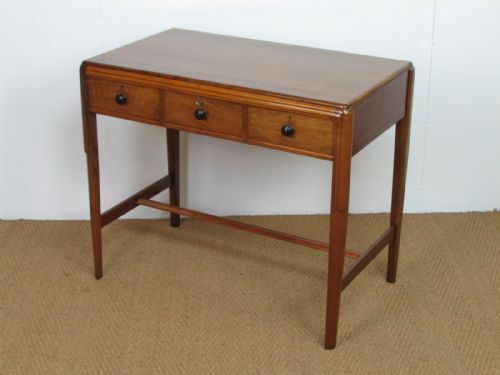 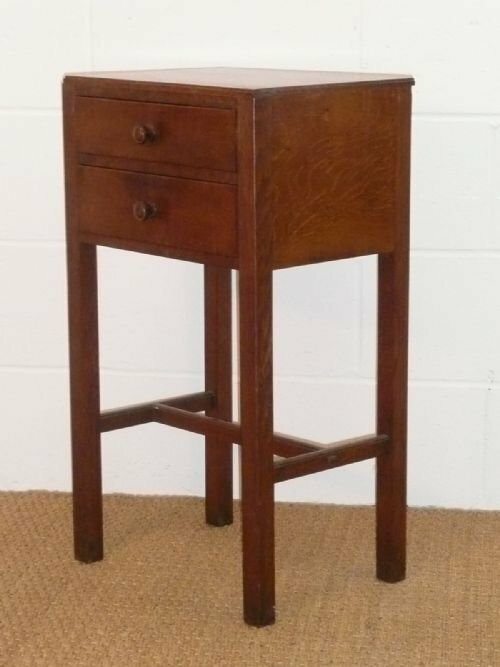 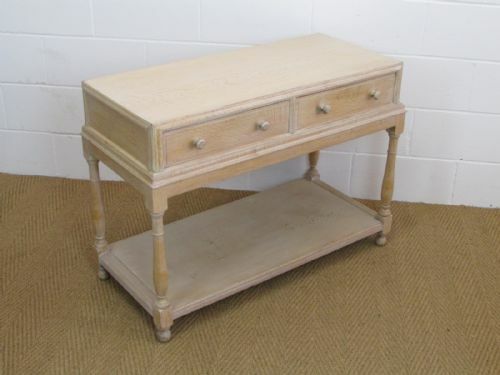 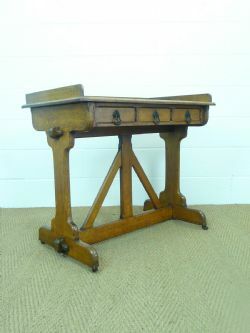 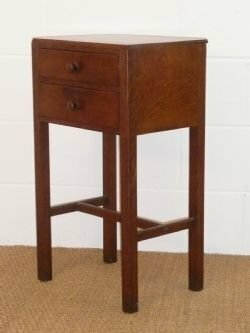 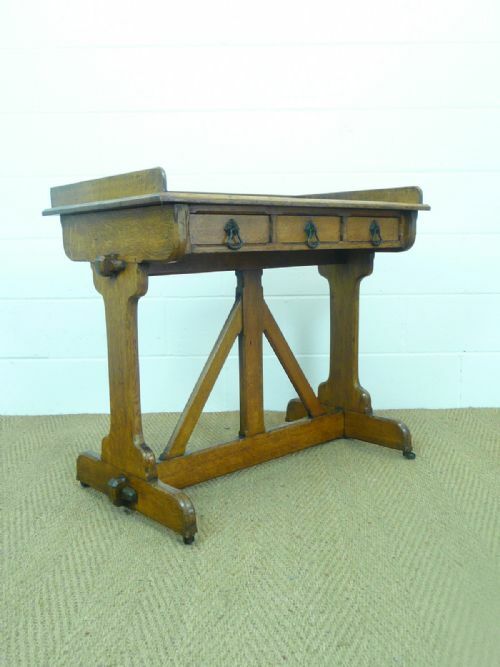 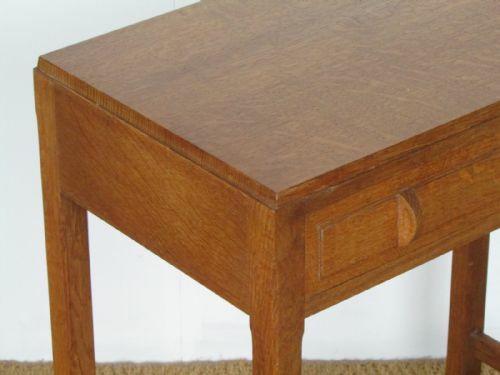 Table 1: Width 20", Depth 13.25" & Height 24.25"
Table 2: Width 16", Depth 13.25" & Height 23.5"
Table 3: Width 12", Depth 13.25" & Height 22.5"
The table: A Cotswold School two drawer side table with domed octagonal handles and through tennons to stretcher. 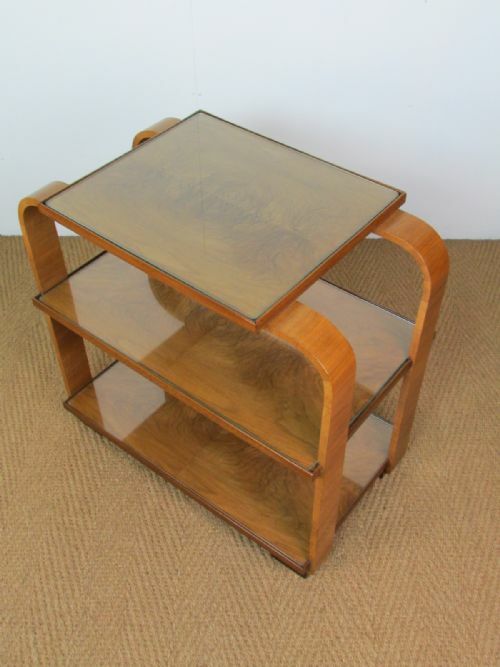 Designer / maker unknown although similarities to Peter Waals circa 1930. 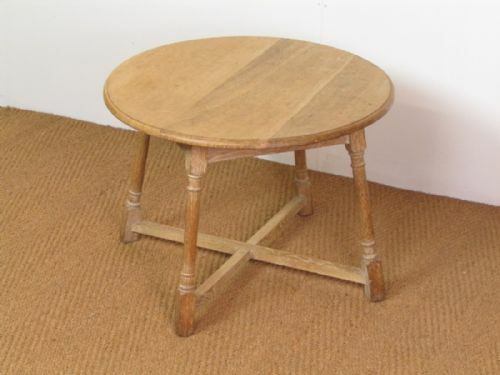 Condition: Offered in excellent condition. 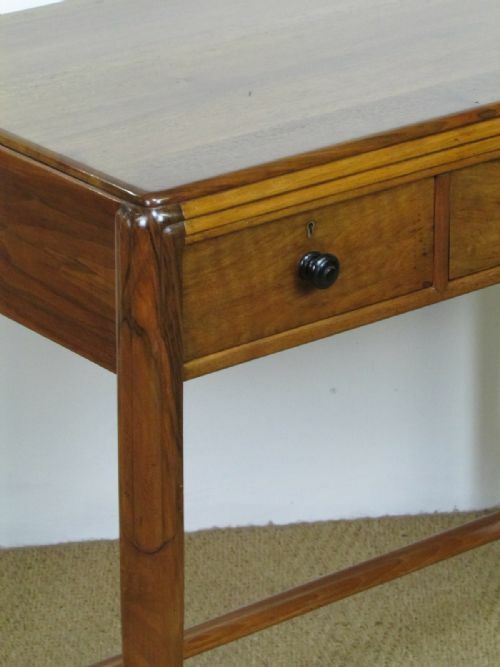 Original finish revived. 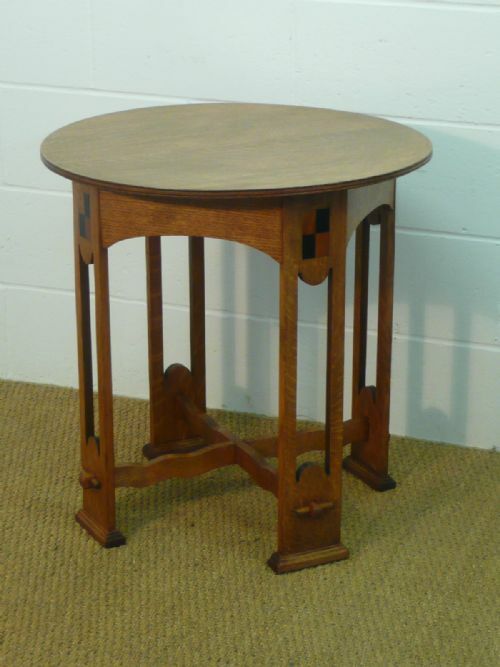 The table: An Arts & Crafts oak circular side / center table with inlaid decoration and exposed pegged through tenons. 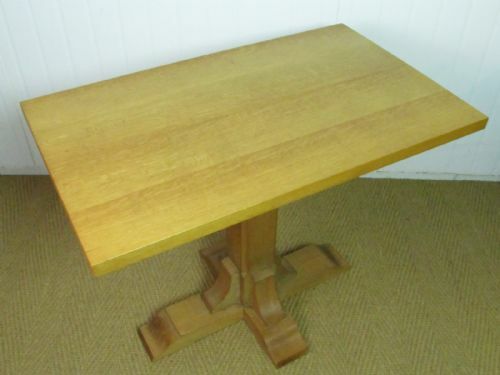 Condition: to be offered in excellent condition. 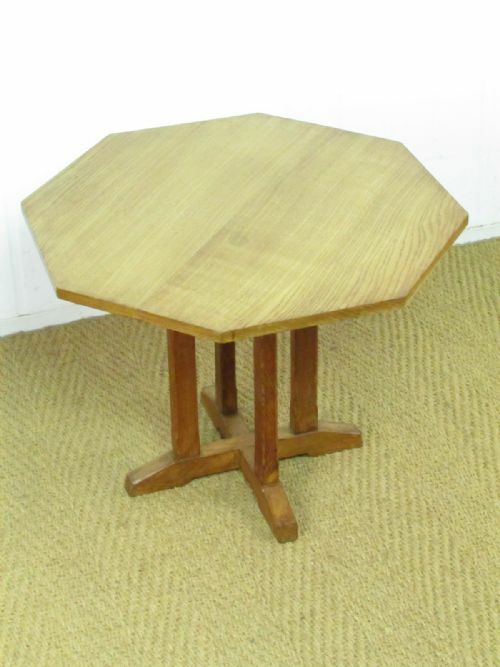 Dimensions: The table top stands 27.75" tall and 27" in diameter. 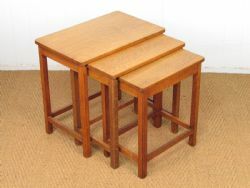 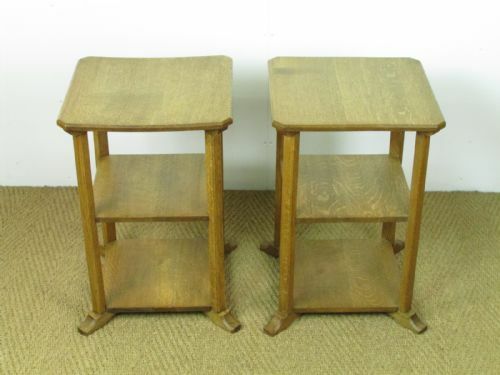 The tables: A nest of three oak side tables by Heal's c.1930. 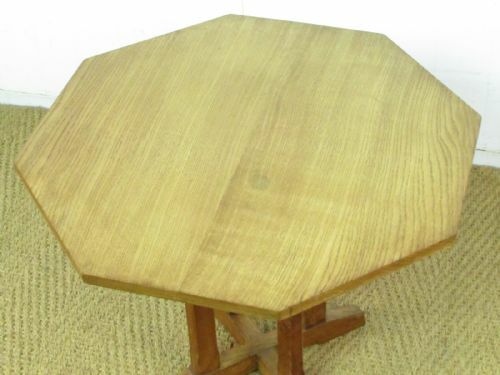 The tables are all constructed in solid, well figured, quarter sawn oak. 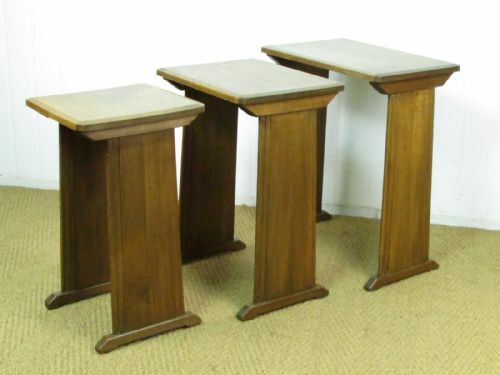 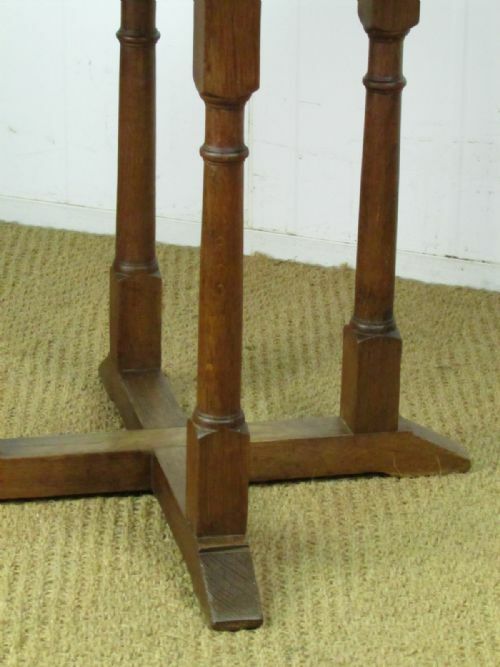 Condition: Offered in very good original Condition - bases cleaned and waxed, tops refinished. 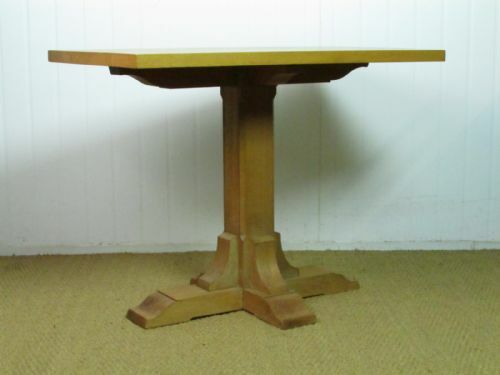 Dimensions: The largest table stands 19" tall, 28" wide and 12.75" deep. 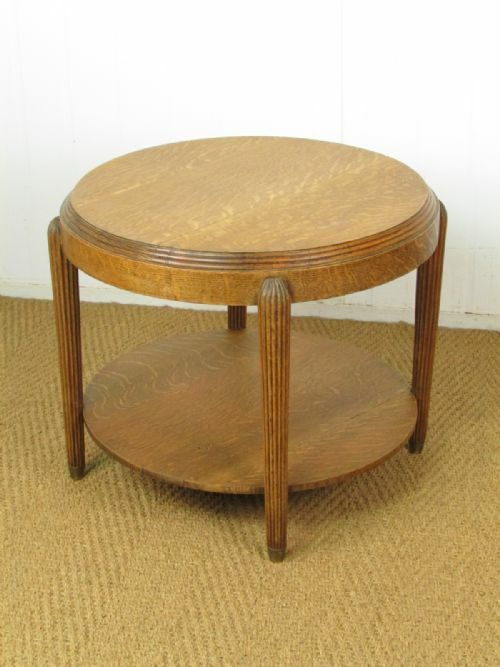 The table: A limed oak circular occasional / coffee table with "Tilden" style gun barrel legs joined by cross stretchers attributed to Heal's c.1925 to c.1930. 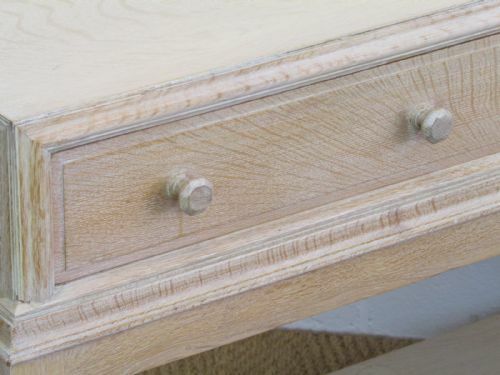 Very well made in solid quarter sawn oak. 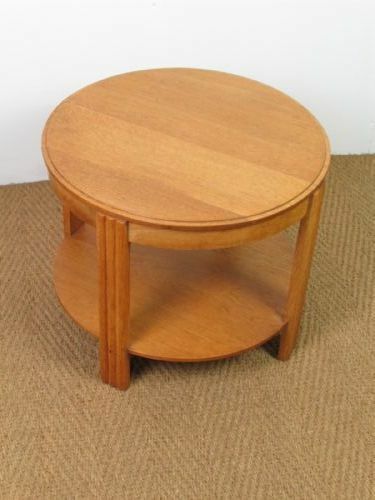 No label. 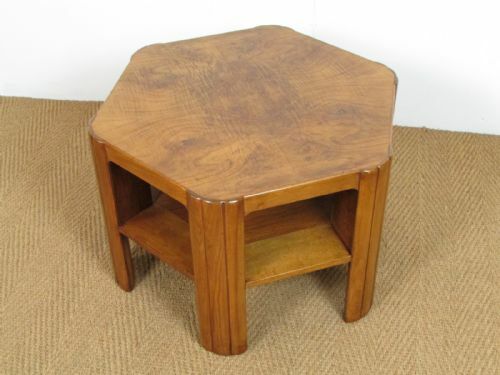 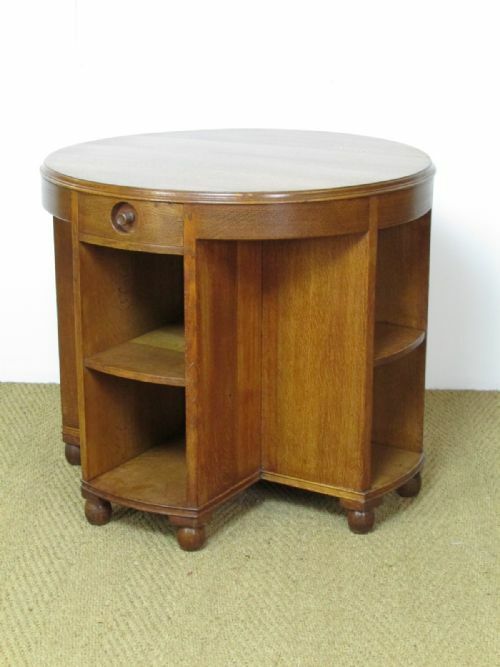 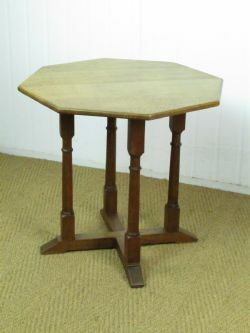 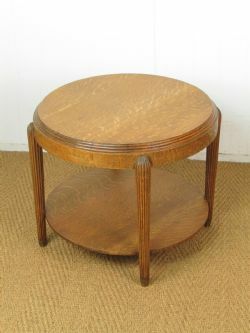 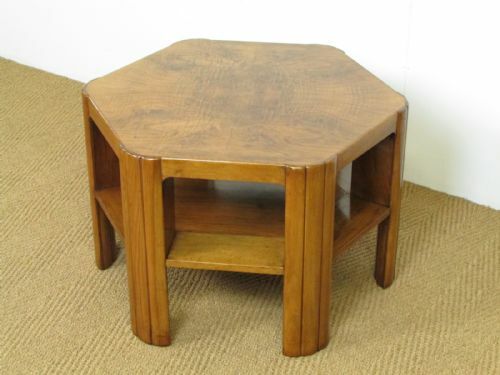 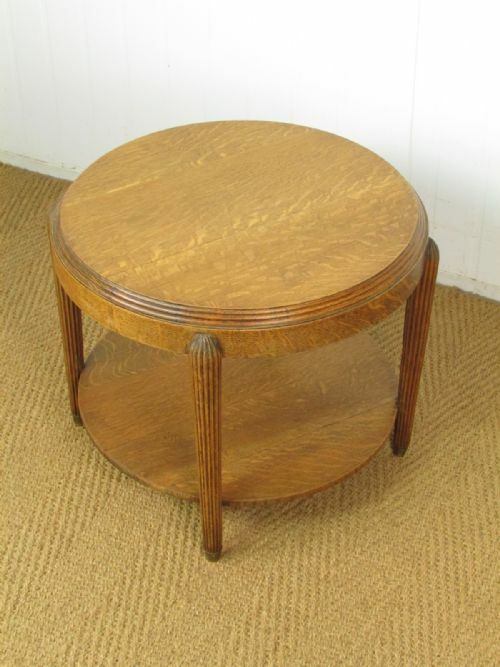 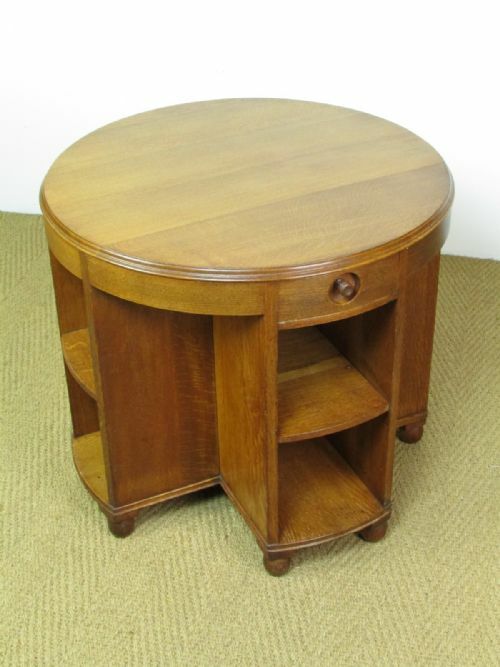 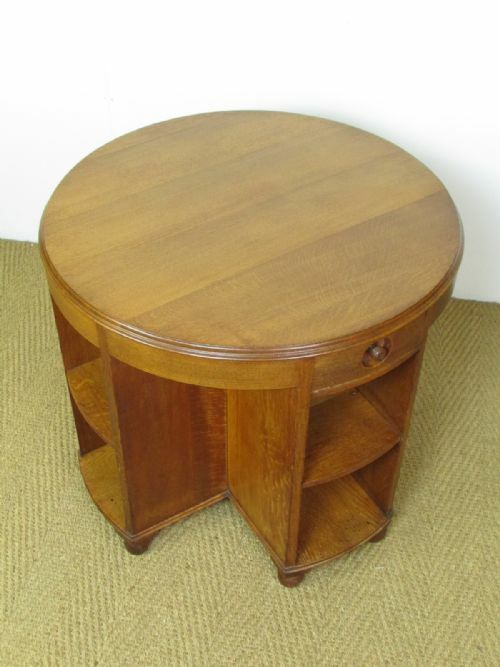 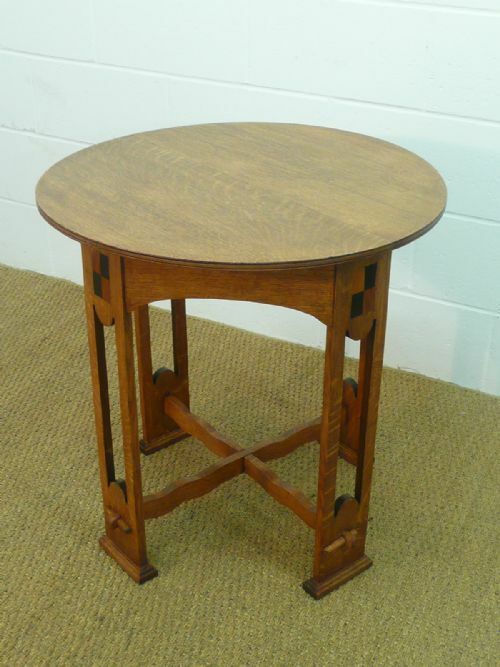 Dimensions: Diameter 26.5" & height 19.25"
The table: An oak Heal's "Tilden" style octagonal side table dating c.1925. 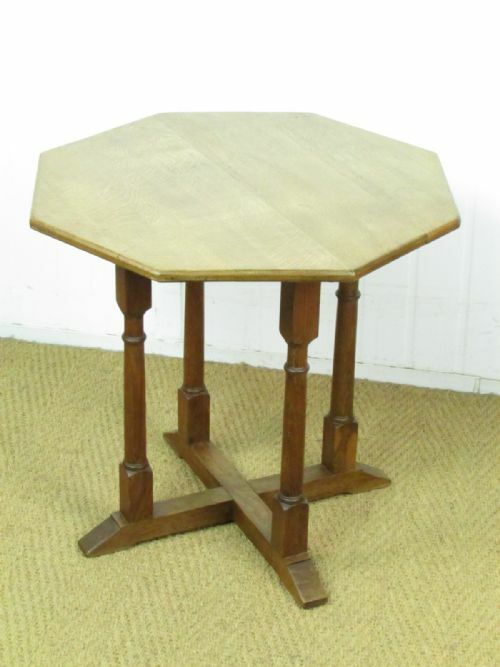 This table is constructed in well figured quarter sawn oak, with an octagonal top over four turned gun barrel legs joined by a cruciform base. 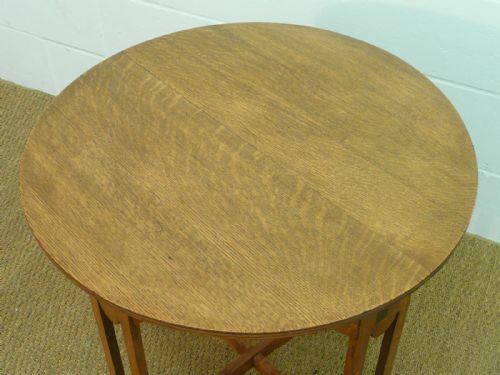 Condition: offered in very good, partly refinished condition - the base has been simply cleaned and waxed, the top has been refinished but maintaining its naturally bleached appearance. 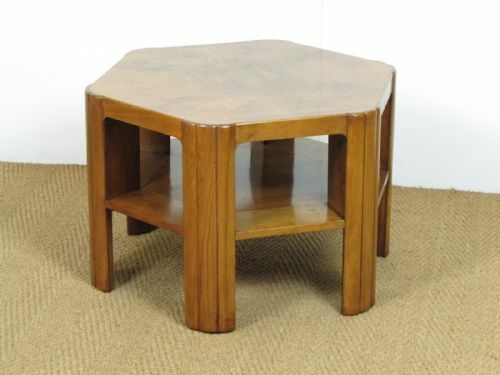 The table: A French Art Deco oak two tier occasional side / coffee / lamp table dating c.1925. 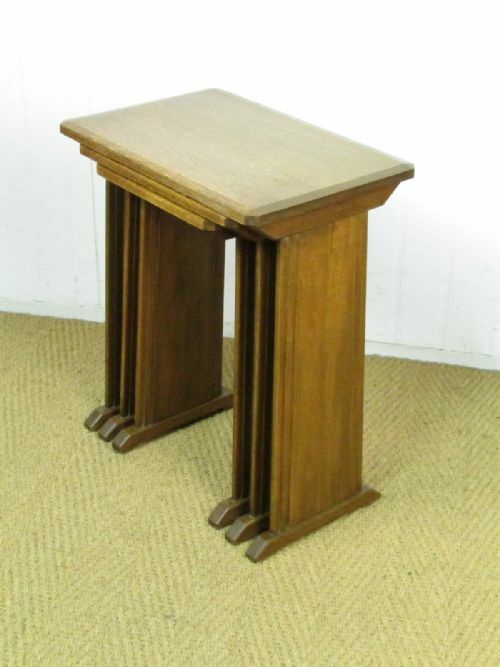 Constructed in well figured quarter sawn oak with a stepped moulding, reeded supports and brass feet. 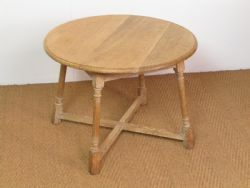 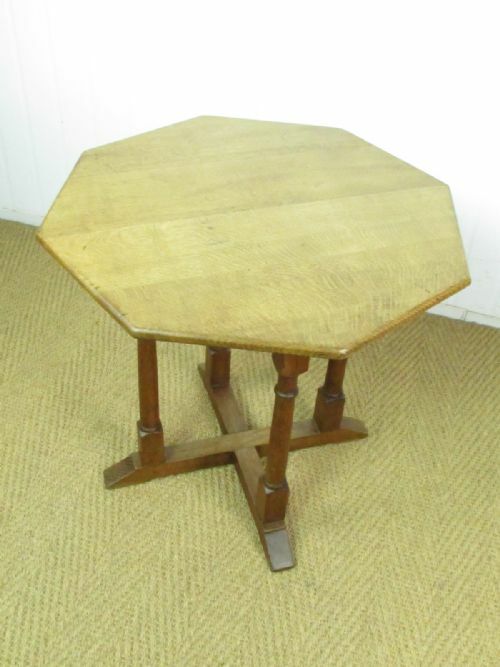 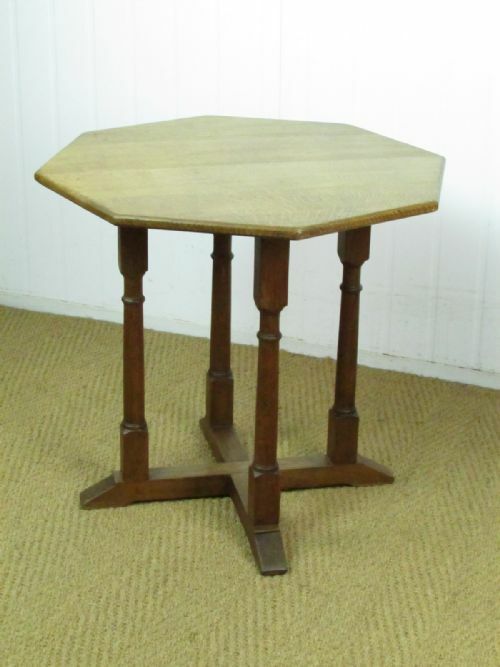 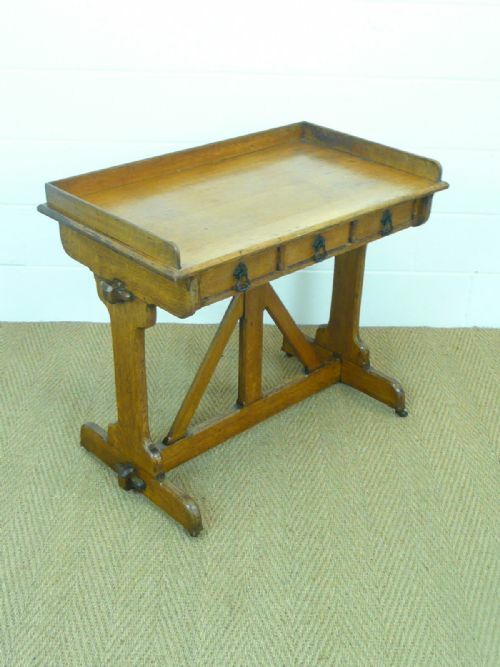 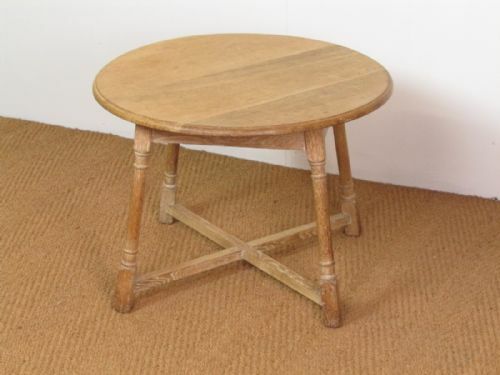 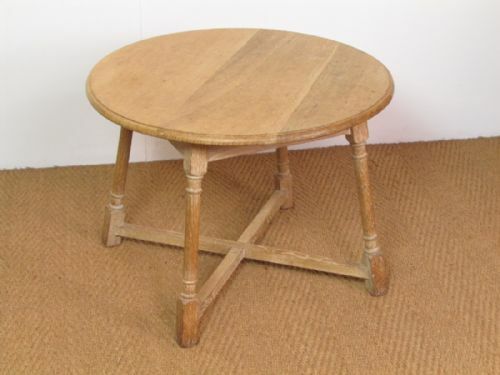 The table: An English Arts & Crafts Cotswold Style oak side occasional table dating circa 1930. Constructed in solid quarter sawn oak with an octagonal top over four supports joined by a cruciform base. 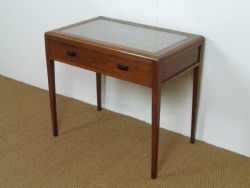 Dimensions: The table top stands 18" high and has a maximum depth of 25". The table: An Art Deco two tier coffee / side table dating c.1930. 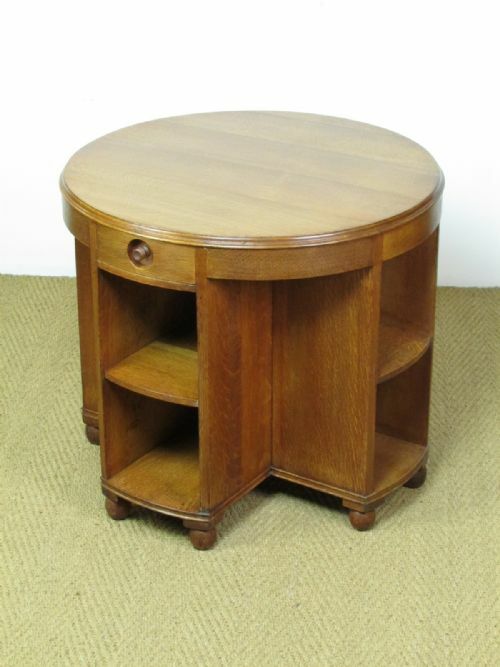 Constructed in solid, well figured quarter sawn oak. 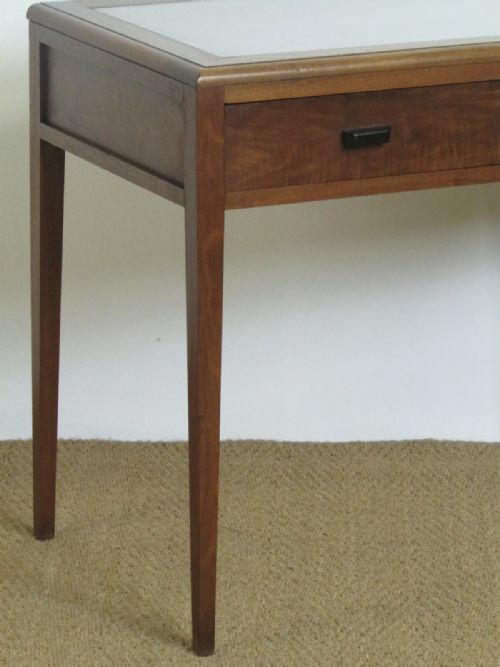 Maker unknown. 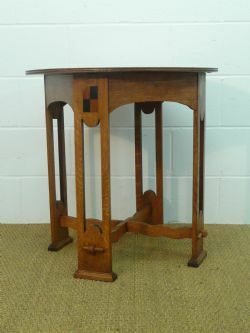 The table: A Gothic Revival oak side table with three frieze drawers and galleried top attributed to A.W.N. Pugin c.1845. 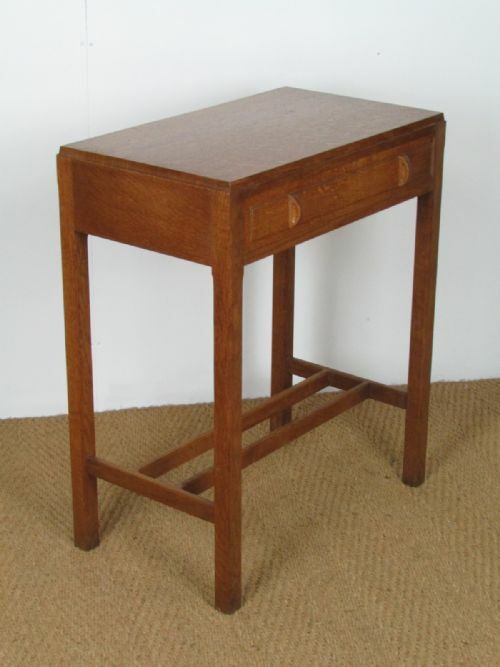 The table: A limed oak two drawer side side table by Heal's c.1930. 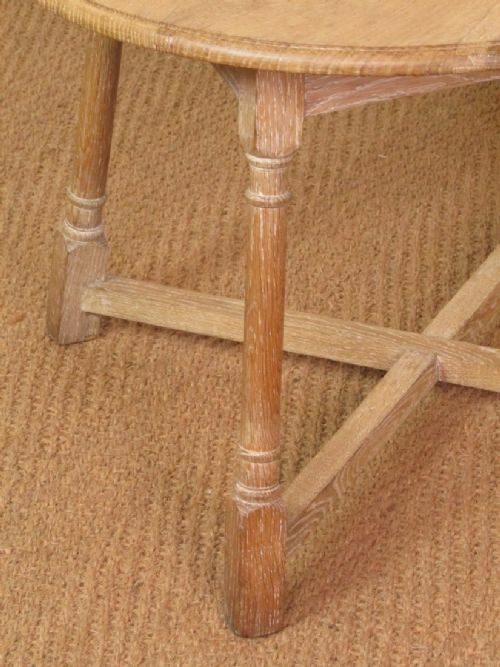 Labelled & provenance. 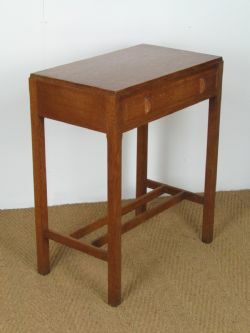 Dimensions: width 41.75", depth 18.75" and height 29.5". 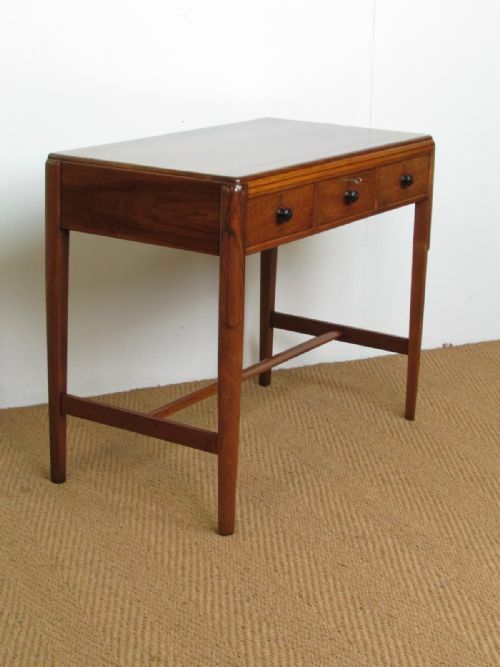 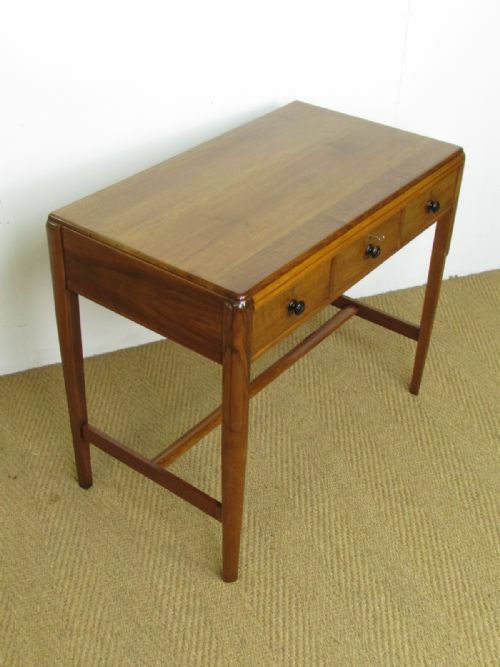 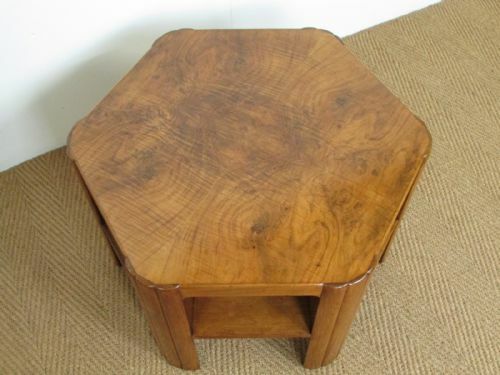 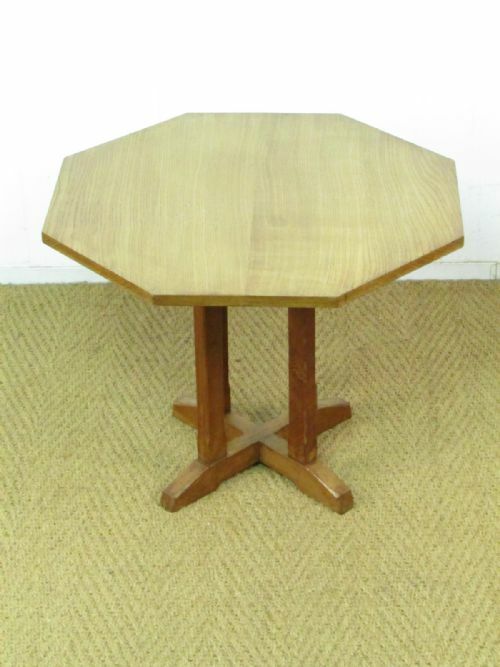 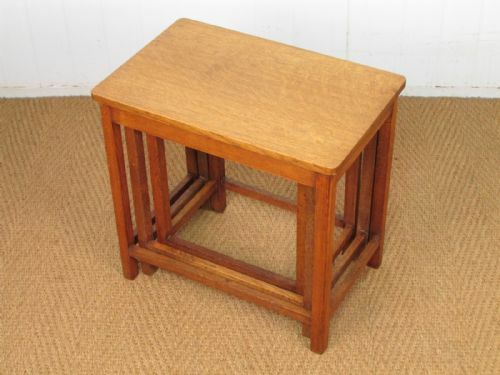 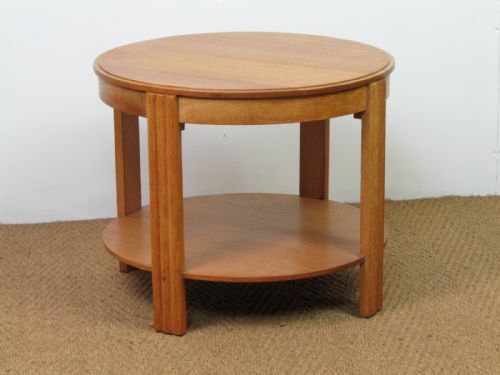 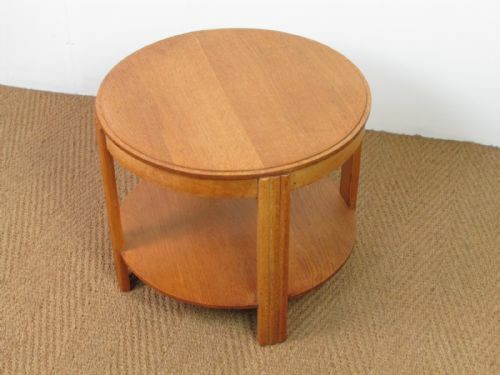 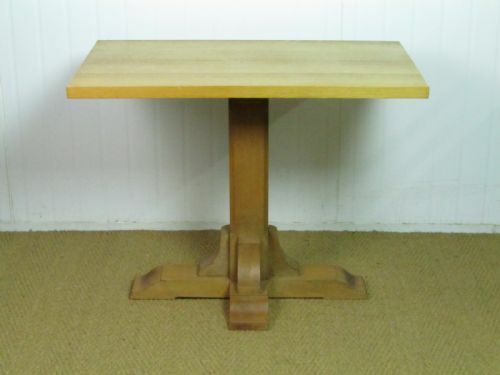 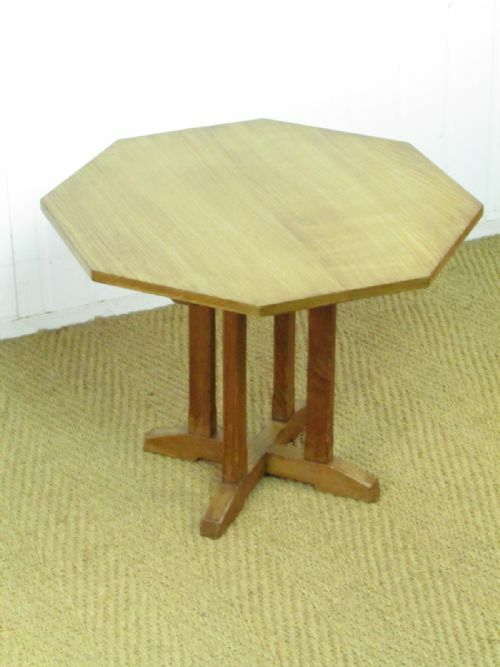 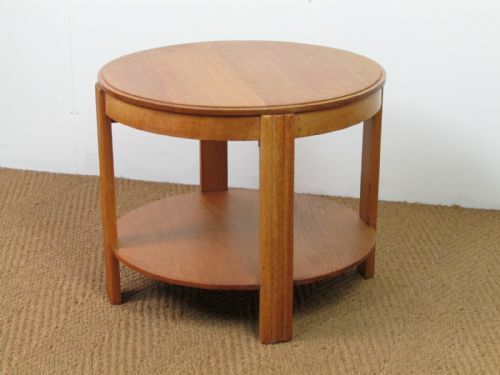 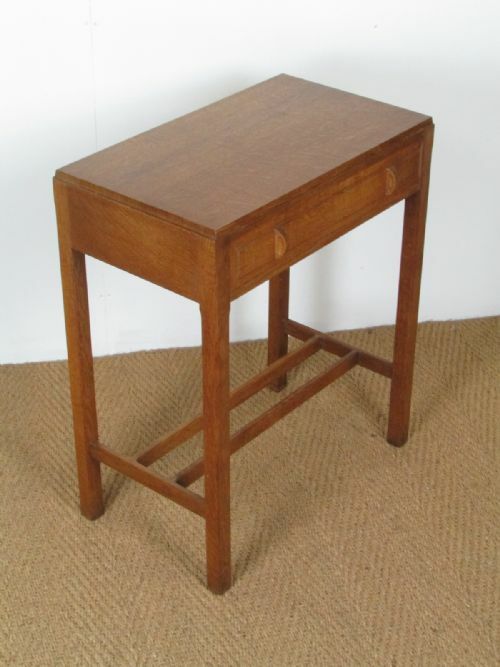 The table: An Arts & Crafts Cotswold School side table after Peter Waals made by Kenneth Desmond Lampard c.1950. 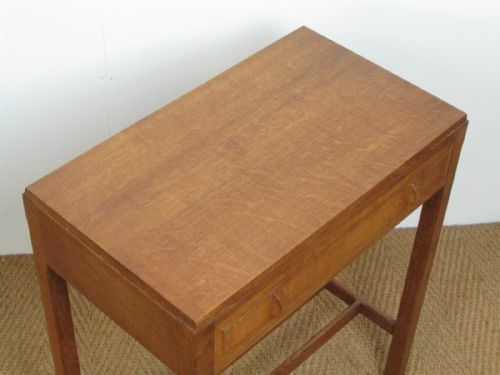 Kenneth Desmond Lampard (born 1926) was a pupil of Edward Barnsley in the late 1940's. 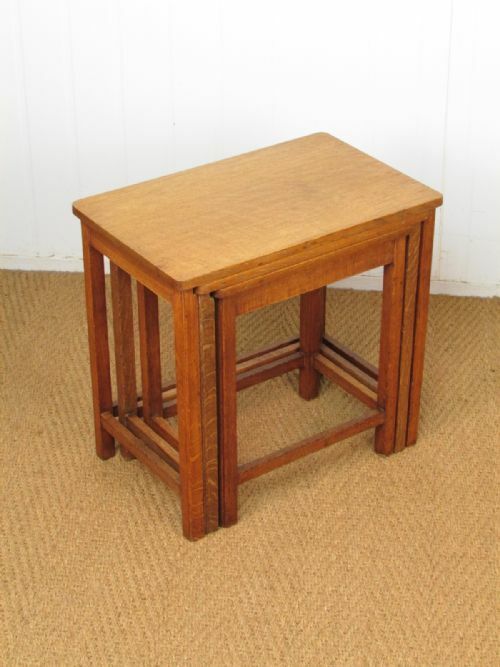 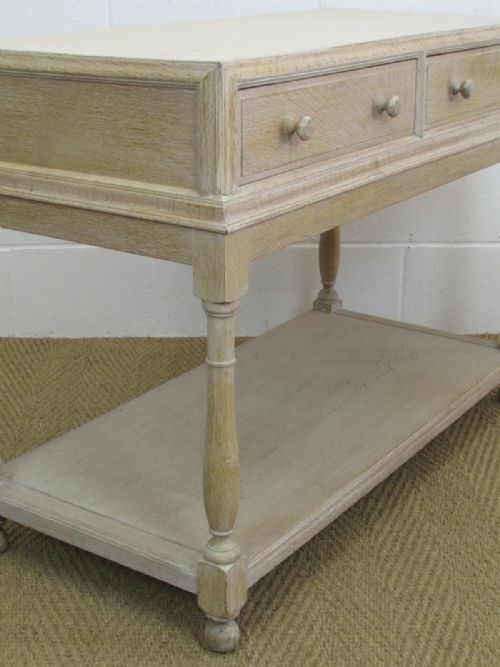 The side table is constructed in solid well figured quarter sawn oak. 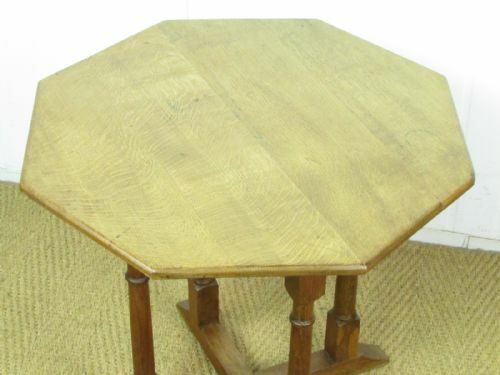 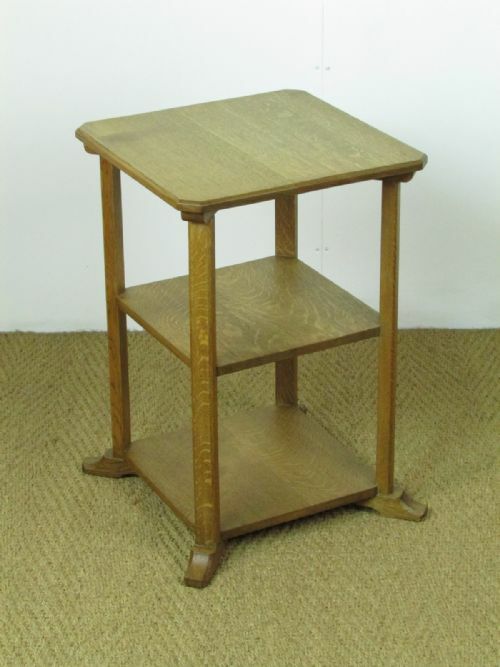 The table: An oak book table by Heal & Son c.1923. 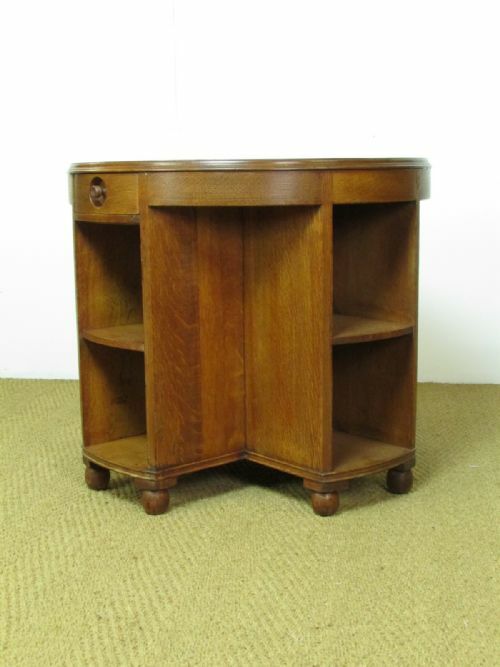 Four bookcases to the base in cruciform under a circular top with two frieze drawers. 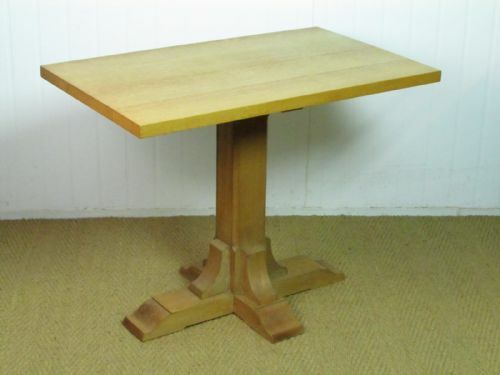 Constructed in solid well figured quarter sawn oak. 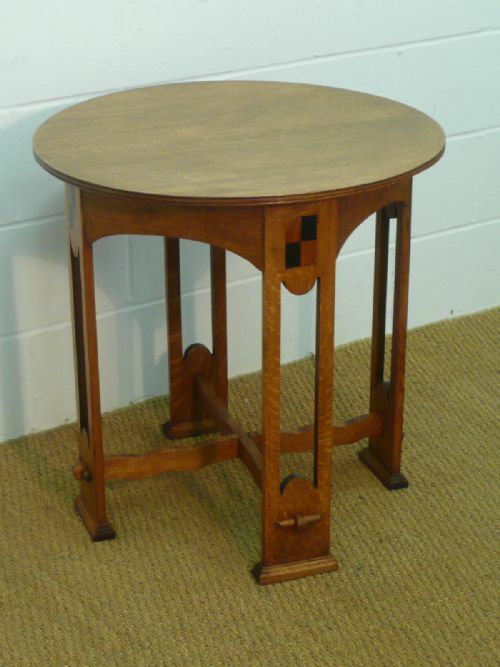 No label but Heal's famously produced a few variations of this design throughout the 1920's & 1930's. Dimensions: Height 26.5" & top diameter 30"
The table: A hexagonal figured walnut two tier occasional book table by Heal & Son c.1930. 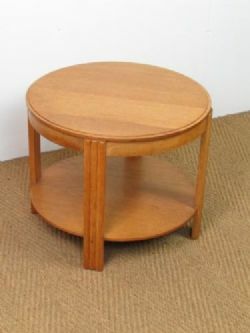 Dimensions: Height 20", Diameter 28" (side to side) or 31.5" (apex to apex). 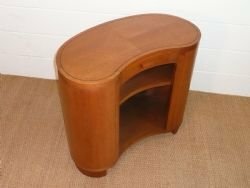 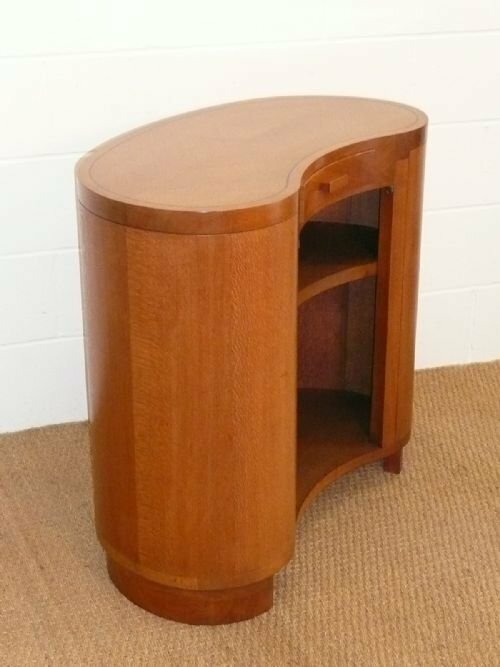 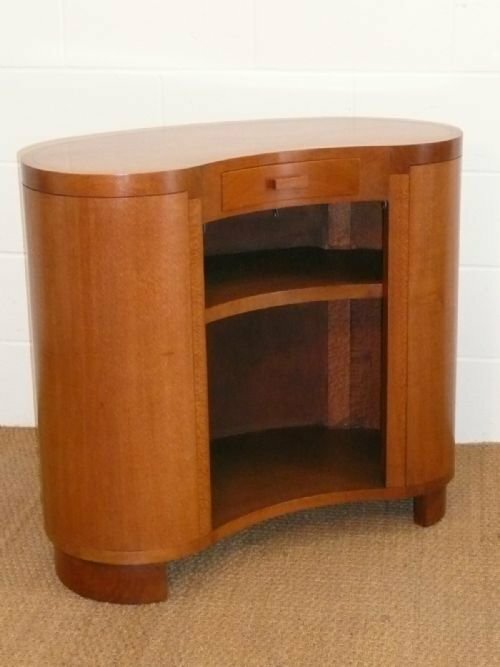 The table: An Art Deco side table / cabinet constructed in solid Queensland Silky Oak in the manner of Betty Joel circa 1930. 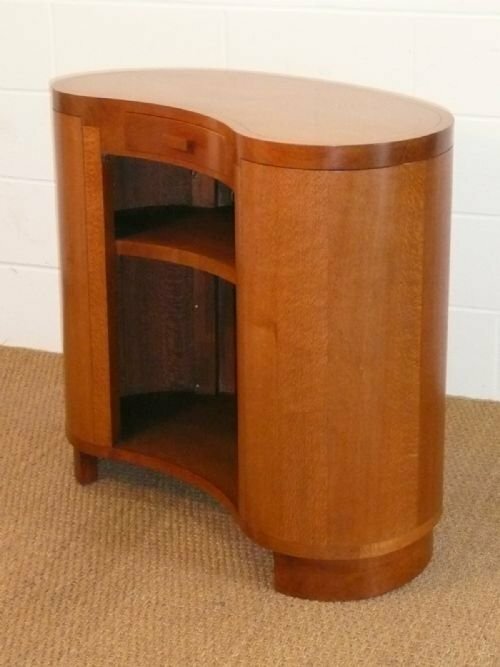 Kidney shaped quarter veneered top over a single drawer and open shelved area. 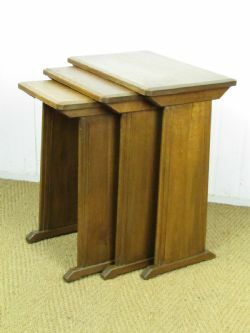 Dimensions: The table stands 32.5" tall, 36" wide and approx 16" deep. 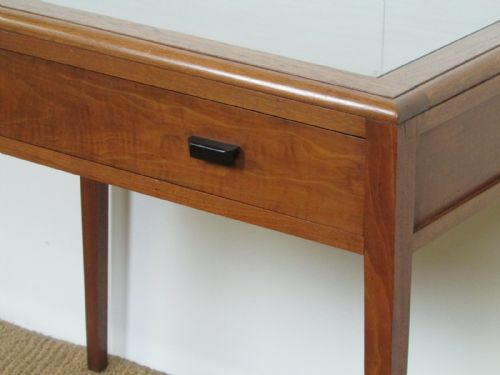 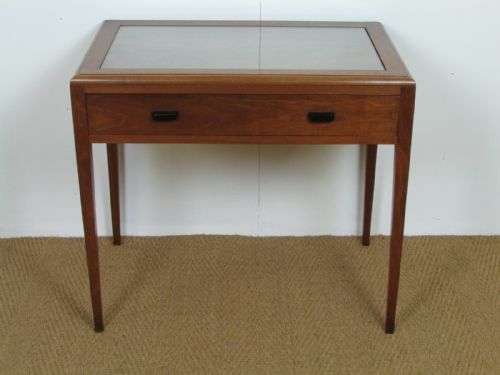 The table: An Art Deco walnut side / hall / writing table by Bath Cabinet Makers c.1925. 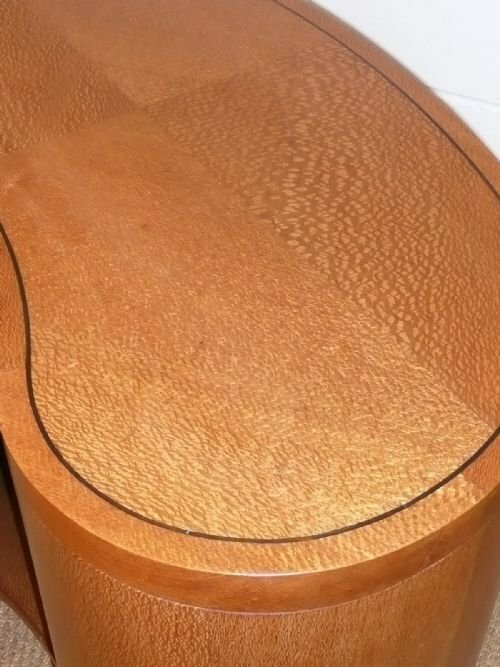 Inset label missing. 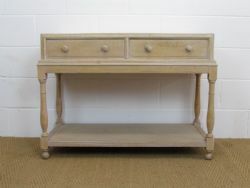 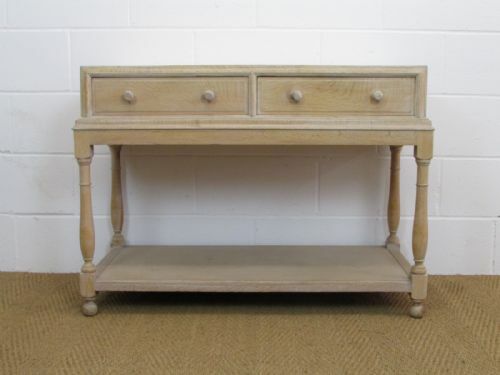 This table has moulded detail and contrasting turned handles to the three frieze drawers. 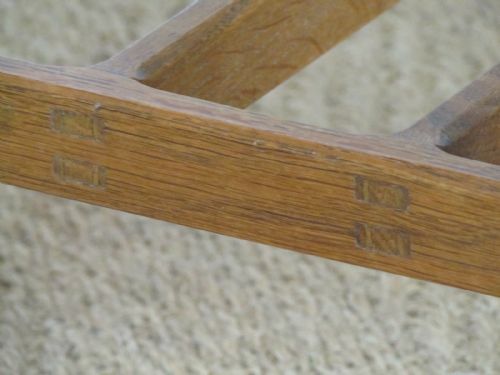 Working locks operating from the single key. 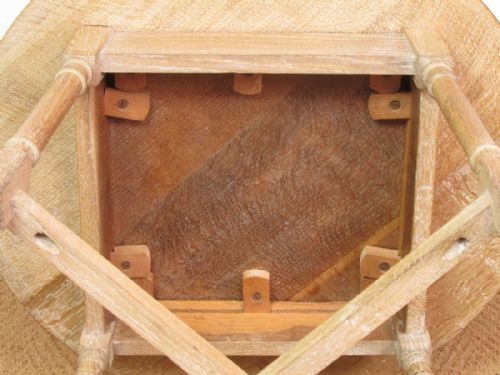 Dimensions: Width 36", depth 20" and height 30". 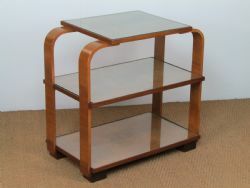 The table: A walnut side table with singles drawer and inset glass top by Betty Joel c.1930. Dimensions: Width 33", depth 21" and height 29.5"
The tables: A (matched) pair of oak 3-tier side occasional tables made by "Hypnos" for Heal's c.1930. 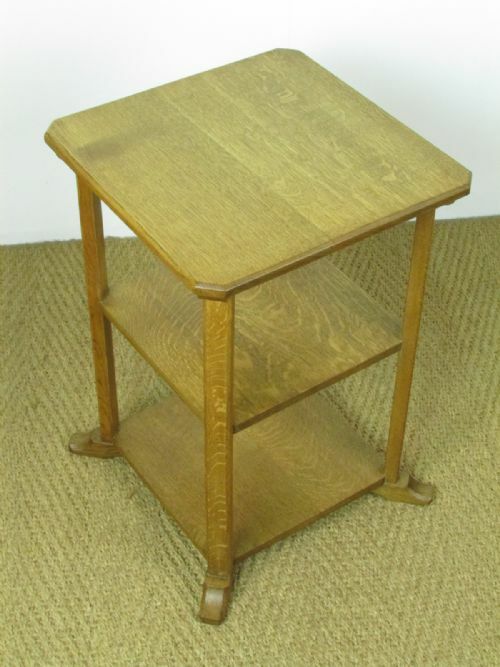 Constructed in solid quarter sawn oak. 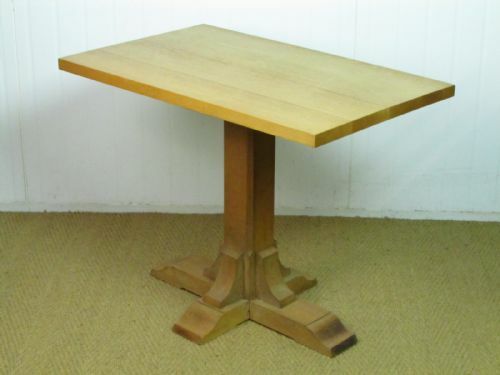 Dimensions: The table stands 22" tall, 15" wide and 15" deep. 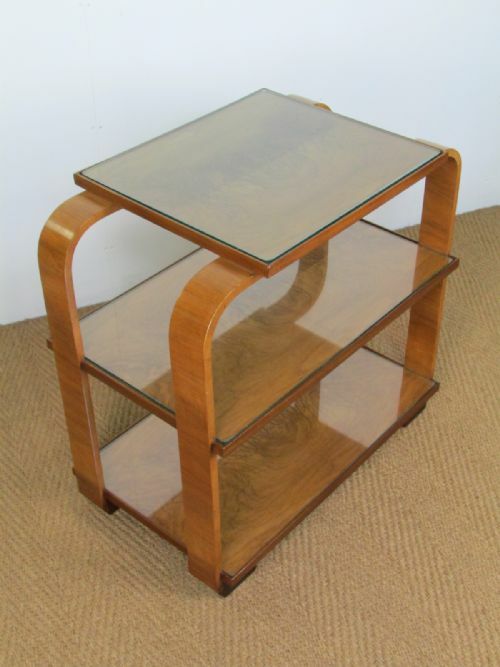 An Art Deco walnut 3 tier side table dating c.1930. Excellent form and superb quality with well figured walnut tops. 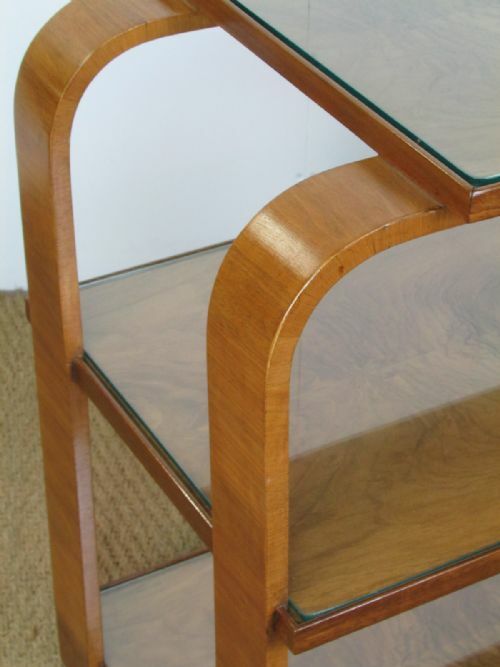 Each tier has it original glass inset top. 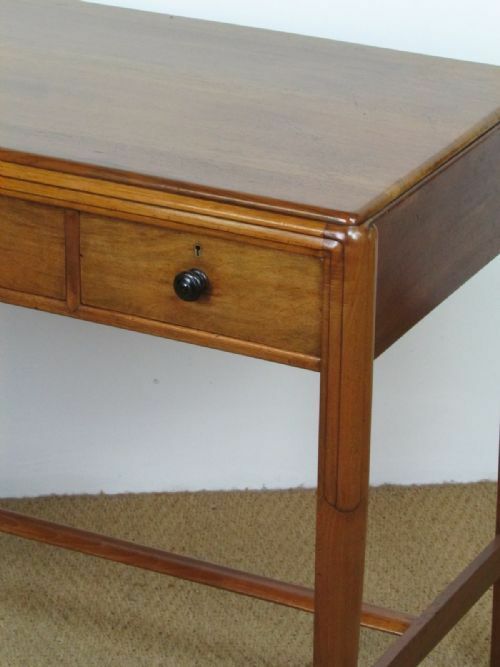 Offered in excellent refinished condition. 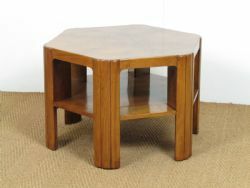 Dimensions: Height 27.5" Width 28.75" and Depth 17"